Front row (left to right): 1. Greg Pierce, 2. Sylvia Hatfield, 3. Norman Takemori, 4. Brent Gillespie, 5. Bill Dougherty. Second row: 1. Jeff Jessup (sitting), 2. Greg Odell, 3. Gilbert Takemori, 4. David Silberberg, 5. Matt Finders, 6. Robin Huber. Back row: 1. Mike Ward (director), 2. Steve Journeay, 3. Carl Holladay, 4. Marc Foote, 5. Tom Niven, 6. Mike Davidson. Credits: From the collection of Matt Finders. Thanks to Robin Huber, Diann Hatfield, Jim Tinder, and Norman Takemori for helping to identify the people in the picture. 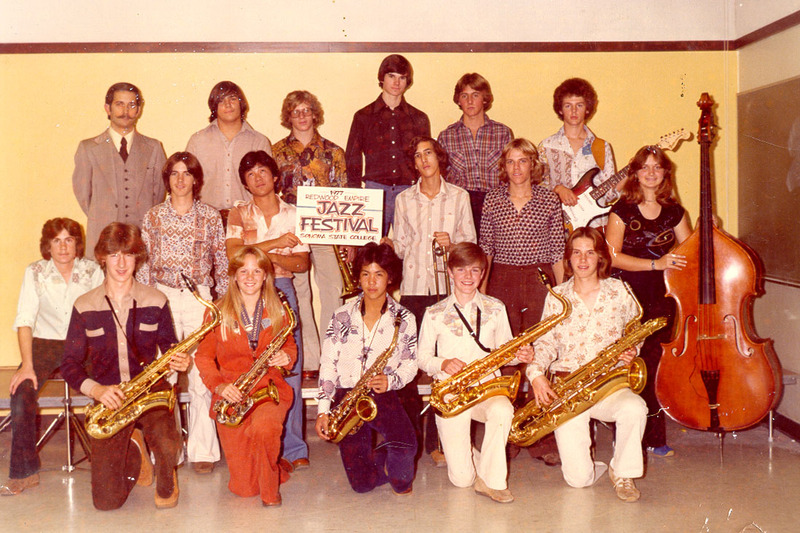 The kids in the picture are members of the high school graduation classes of 1978, 1979, 1980, and 1981. To find other pictures of these classes in the archive, see Livermore class pictures listed by year of high school graduation. And if you have any pictures from this era that you would like to share, please submit them to the Archive.